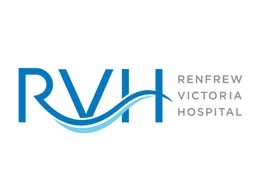 Renfrew Victoria Hospital is a fully accredited facility, offering, surgical, medical, and complex continuing care. Special in-patient services include a Special Care Unit, Palliative Care, and Pastoral Care. Renfrew Victoria Hospital has been designated by the Ministry of Health and Long-Term Care as the Regional Centre for Renfrew County Nephrology Services. As such a 20-station hemodialysis unit is located at RVH, a 6-station satellite hemodialysis unit is located at the St. Francis Memorial Hospital in Barry’s Bay and a six-station unit at the Pembroke Regional Hospital. Pre-dialysis care clinics are also offered. We offer 25 specialist out-patient clinics and a satellite oncology service. RVH sponsors county-wide services in Addictions Treatment Services, Ontario Breast Screening Program (OBSP), Regional Assault Care Program, and Sleep Lab. There is full diagnostic support within the hospital including staff radiologists providing radiological, ultrasound, bone density, CT and mammography support. In addition there is a comprehensive surgical program with a surgeon on staff. We also have an Internist on staff who provides exercise stress testing, echocardiography, cardiopulmonary and allergy testing.